See Mike and Fred walk/half-run, Walk/half-run boys....walk/half-run! So. Rudy's supposedly--gasp!--"p*ssy-whipped", and now albatrossed with his mobbed-up former BFF? Ooh! Like, can you believe McCain was like gonna...like totally friggin' back-stab his like...own friggin' party in '01? Like...whoa! Romney's flippin' around like a meth-ed up halibut. ¿Tom Tancredo? ¡Es mas loco! P*ss-poor few "heart" Huckabee. Um. Uh. You know--like to the uh...voters. Hmmmm. Yeah. I gotcha. Well, let's look at the two "studs" folks are so hot to draft, shall we? His name is Michael R. Bloomberg...billionaire. He owns a mansion and a yacht. And several jets. And a business news empire. A skyscraper or two. As well as the office of Mayor Of The City Of New York, presently. His credentials? Five billion of 'em, baby--with George Washington's face printed in green on each one. He's a "moderate" republican--which means he'd never, never ever let the word "n*gger" cross his lips, so stop bothering him about those other mean republicans who would, dammit! He's too busy "moderating" stuff, okay? And this froggy-visaged, elfin savior of the GOP is able to call his good friend, Me-first-o-crat Senator from Connecticut, Joe Lieberman on the phone and GET. SH*T. DONE! 1.) Speak in a grave faux-important monotone about EVERYTHING--This will give your Napoleonic *ss some GRAVITAS! 2.) Go to skate shop to get new kneepads. Recycle old ones as coffee filters. 3.) Pat each other on back. Remember to wipe yellow residue from hands afterward. 5.) Don't forget method acting class take-home exercise: Portray a human Tucks Medicated Pad. Your motivation? The President's *ss. Yes... the key component in the Bloomberg charm--beyond the five billion self-financed ones, is that well-documented, down-the-middle, moderate stance on things. He appeals to the mushy center, that flabby, spare-tire of voters too lazy to work themselves into informed-voter condition. You know...supposedly everybody. How mellow it must be to come down on no one side or the other and be completely, blissfully non-partisan. "For at least a year before the 2004 Republican National Convention, teams of undercover New York City police officers traveled to cities across the country, Canada and Europe to conduct covert observations of people who planned to protest at the convention, according to police records and interviews. The totally down-the-middle Mr. Bloomberg not only signed off on this gross abuse, but backs it still--defending the city's withholding of info about the over-the-top spying on progressives using the day-old, dishwater-weak excuse that release of the documents would inflame and put the city at a disadvantage in defending against the numerous lawsuits resulting from the city's extreme "gulag-ing" anti-GOP protesters. Why, oh why pray tell, would disclosing the truth prejudice a case...unless the truth indicated some level of wrong-doing? You see, I take a very, very dim view of governmental spying on American citizens. My family was a target of government surveillance in the 60's and 70's--victims of the pre-Cointelpro excesses of the FBI and the NYPD's infamous "Red Squad". Bristling at overzealous police surveillance and agent provacateur-ism doesn't spring from mere tin-foil hat paranoia. Google the name Fred Hampton to see what unfettered, crazed police skullduggery can result in. It ain't f*cking pretty. Nearly 2000 people were rounded up and locked away during the convention--often with none of the due process mandated by law. Marchers herded by police and tricked into arrest traps, detained for days without outside contact, with their personal property unjustly withheld (including medicines)--in some cases to this very day--and destroyed. And the vast majority of those arrested broke no laws--they were merely in many cases in the wrong place at the wrong time, caught up in draconian, willy-nilly sweeps. Yet Bloomberg, this so-called paragon of fairness supports this ridiculously partisan bullsh*t---In addition to displaying a general and well-enforced distaste for public exercises of First Amendment rights via protests of any sort in the city. Sprinkle in an officious disdain for the plight of the city's middle class, as evidenced by his "thugs" name-calling during the transit strike, his uncaring, "let them eat cake" attitude while hammering NY'ers with unfair post-blizzard fines and tickets, and his misplaced Mike Brown-ish backing of ConEd when they pig-f*cked the handling of the Astoria blackout last year, and the Mister Perfect veneer he's cultivated assiduously through a compliant media tarnishes like a "gold" chain bought from an alley hustler. Oh, and don't let his bottom-of-the-deck finagling of the West Side Stadium deal get out to the rest of the country, where people as a rule give the voodoo stink-eye to even hints of municipally-funded stadium bullsh*t. "Ding!" Bellhop! take Mr. Bloomberg's baggage will you? Yes...I think you'll need to make two trips. Onto Mr. Thompson now. Or, "Toad" for this discussion. Leave us to peruse his appeal. This lumbering, hangdog, mountain of southern manliness! This champion of the rope-belted Perfesser Glenn Reynolds--fellow disingenuous scolds and Tennesseans both. Possessor of a honeyed, Eeyore-ish drawl, which he wraps around folksy catchphrases and homilies that'd make even Dan Rather say "Um...what the f*ck did that mean?" A "star" of Law & Order in his role as the anachronistic, imported-from-East-Bumf*ck, Manhattan D.A. Arthur Branch--antagonizing the belief suspension of every viewer of the show, save for those few flyovers who you can best bet, rooted for William Windom's Prosecutor Gilmer to triumph over Gregory Peck's Atticus Finch in "To Kill A Mockingbird". But, but--the real selling point of the Shar-Pei faced, would-be candidate lay in something more tantalizing. It's that pathological GOP quest for someone new to slip on the smiling Reagan mask. The glamorous mask that allows one to push for the vilest, most retrograde sh*t imaginable, but get away with it because of a bit of Hollywood charm. So, as Ron Silver's too C-list these days (and too Jewish for a hateful Grand Olde Party), and Schwarzenegger can't "Hasta la Vista" the Constitution away, the mantle falls to ol' croaky Fred--who make no mistake, deftly espouses the freeper wet-dream list of poisonous policies, baked deep in a rich, gooey cupcake of message delivery for those whose addiction to political "sweets" trumps the common sense of how bad they are for you in the long run. Alas, our "baker" is a well-known lazy son-of-a-b*tch. Reknowned for his sloth and flagging interest during his brief tenure in the Senate, and doubly demonstrative in his ponderous, galumphy performance style. Not a helluva lot of fire in that broad, prosperous belly of his. The image the right wants to sell of Thompson is that of folksy Sheriff Andy Taylor. The reality is more like Griffiths' twisted, down-home Lonesome Rhodes character--shot through with a heapin' helpin' of "Paw" from "The Hillbilly Bears". So there they sit...the two of 'em. 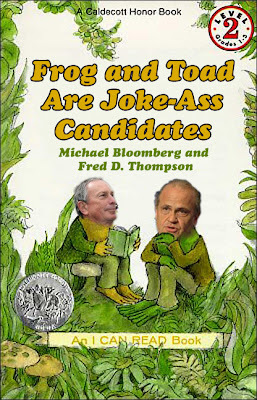 Frog and Toad--croaking out their talking points for all to hear. Waiting for the call to come from on high, for a draft, or for the other candidates to stumble...for opportunity to alight upon their lazy lips. Closer...closer, until..."shlup!" a quick lick of the tongue--and down the hatch it goes. Mmmmm-mmmmm! Ain't the party's nomination tasty? 'Specially when you don't have to work too hard for it. I mean, yeah, the waiting part's kinda hard to swallow--like hairy fly's legs, but oooooh, that not having to "bust your *ss like everybody else" part? Man, that goes down insect entrails smooth.